Disclamer: I’d like to thank Philips for sponsoring this article and sending out their ADR810 dash cam for me to test out. As always, all opinions are my own and sponsorship doesn’t influence my content in any way. Read my full disclaimer page here. While motorcyclists power along our roads with action cams fitted on their helmets, dash cams are becoming popular among car drivers who want to capture proof of road rage and any unfortunate accidents. 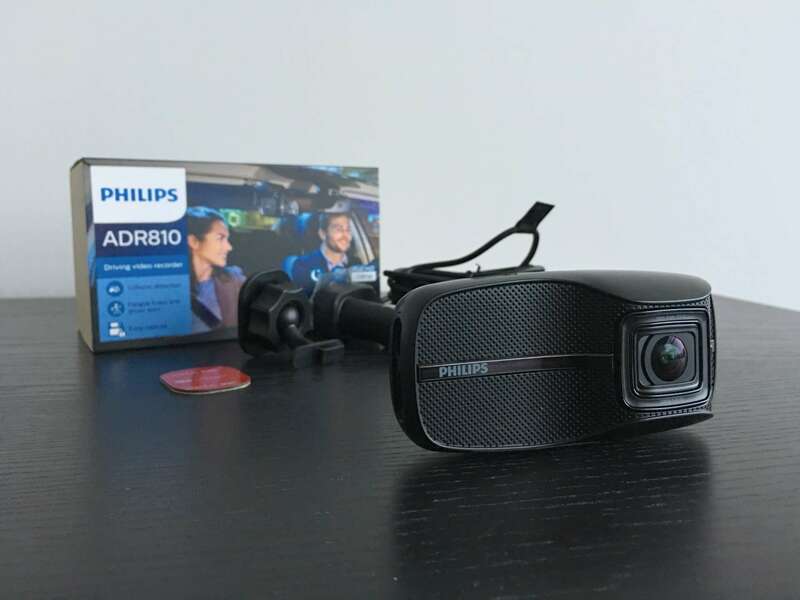 Wanting to show off their new range of dash cams, Philips sent out their top-of-the-line Philips ADR810 dash cam (currently £145) so that I can test it out myself. Why do you even need a dash cam? If that isn’t reason enough to sway you, some car insurance providers offer discounts if you use a dash cam. Are you a little more interested now? I thought so. To give you a little more insight about dash cam technology and what it means for you, I asked Yiqiao Wang, the Mobility Product Manager at Philips, a few questions. Further down this page I’ll also go through my first impressions of the ADR810 dash cam. Fabio: Dashcams are becoming increasingly popular now; why do you think that is? Philips: In the UK, a lot of media coverage has been done on ‘crash for cash’ scammers recently. According to the Insurance Fraud Bureau, ‘crash for cash’ costs the UK £340m every year. 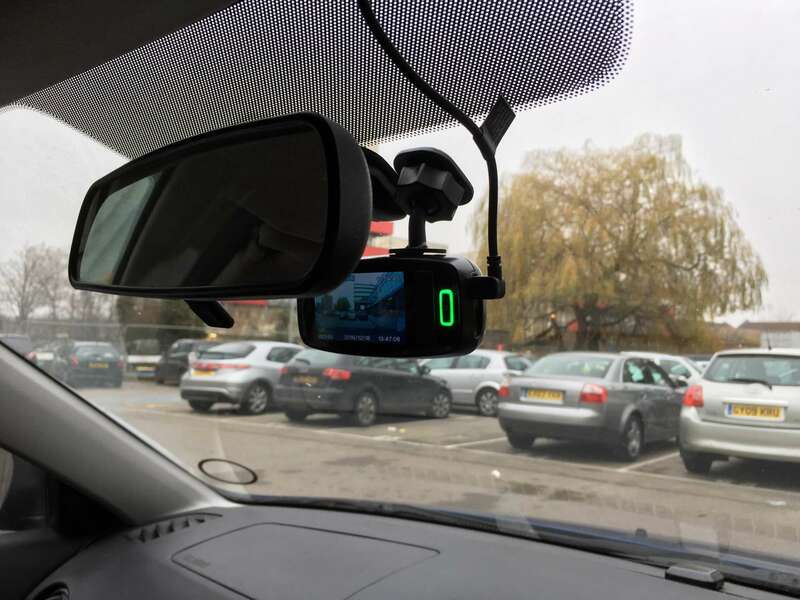 The use of a dash cam could really help honest drivers to prove they are not in fault. Drivers also look for a hassle-free driving experience, they don’t want to think about possible minor or major accidents on the road. Most importantly, they don’t want to worry about finding any evidence when being in an accident. Therefore dash cam is their daily reliable companion. Of course some other people use dash cam to record funny moments on the road as well. Fabio: What are the key features customers need to look for in a dash cam, and why? Fabio: What makes Philips’ ADR810 dash cam special? Philips: Philips ADR810 guarantees best-in-class video quality in the market. It delivers a very high-quality and superior resolution view during the night time. When testing the product during the night, you can assess the superior quality of the recording. We also added an easy-to-use feature which is the “EasyCapture” button on the cigarette lighter. When you feel any potential danger, you can press this button directly and an emergency recording starts immediately, without the need to press some other buttons on the dash cam. Fabio: How do you make the ADR810 accessible for people who aren’t comfortable using technology? Philips: Philips ADR810 has been designed as an easy-to-use plug-and-play product. The only thing to do is fitting the dash cam on your windshield and then it will do all the work for you. It turns on automatically when you start the car. When it detects any movement in front of your car it starts recording automatically. The G-sensor included in the device detects any harsh brakes or impacts and records every detail into the emergency video file. When you want to check the video footage, it is just as easy as reading an SD card in your computer. So, no need to worry about any complexity of using technology at all. Philips ADR810 does everything for you. Fabio: Your ‘Fatigue Index & Driver Alert’ feature looks interesting. Is this purely based on time spent driving, or does it detect fatigue in a more specific way? Philips: It is an algorithm pre-installed in the software. It registers the total driving time and at what precise time you are driving. From there, Philips ADR180 is able to tell you if you should take a break. However, this is not real-time monitoring or detection. Let’s quickly get the geeky stuff out of the way. The Philips ADR810 dash cam’s 156° wide angle lens records at full HD 1080p resolution and at 30 frames per second (which is plenty for a dash cam). It has an “Automatic Collision Detection” feature that auto-saves a clip when you hit something, and an “Emergency EasyCapture” feature to manually record when you need it. You can use the latter by pressing the button found on the cigarette lighter adapter. That aforementioned feature called Fatigue index and driver alert “shows the evolution of a driver’s fatigue and will produce a visual and audial warning message when the driver should have a rest” — but as you may have read in the interview, it’s just based on total driving time and the time of day. It may not provide 100% accurate data based on you personally, although it’s still useful to have a reminder to take a break. I’m liking the ADR810’s all-black design as it keeps the dash cam quite stealthy. 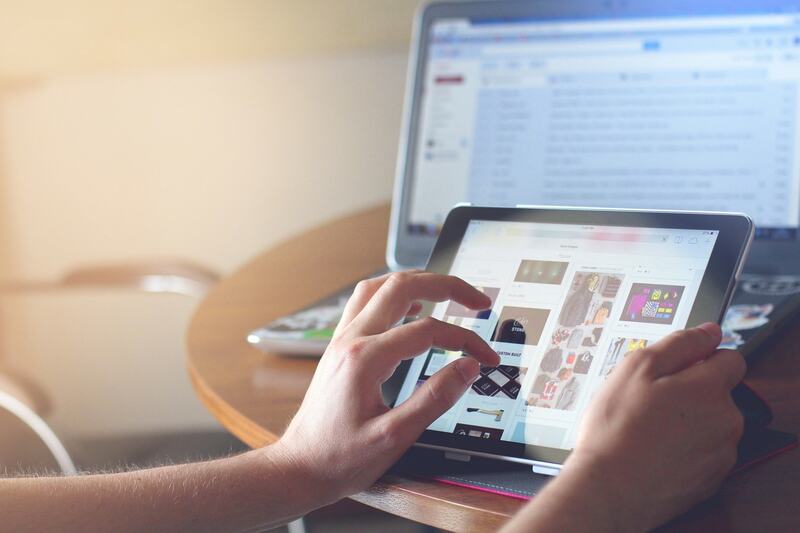 The display is a nicely sized 2.7″ LCD panel, and while it isn’t touch-enabled Philips give you four buttons on the right side of the display to navigate with. It’s also quite a compact dash cam, sizing up at 106.7 x 50.0 x 32.5mm and only 83g in weight. That means you should comfortably be able to squeeze the ADR810 behind your rear-view mirror like I did — assuming you want to keep it out of sight. Unfortunately however, Philips doesn’t throw in the microSD card you need to use the dash cam. (Brownie points taken away.) That’s a shame — especially considering this this SanDisk 16GB microSD only costs £5 on Amazon — because it would have made the customer experience that much easier. It’s not a huge added cost for us as the customer, but in my opinion Philips should just throw it into the package for convenience. What’s it like to use the Philips ADR810 dash cam? Although I would have liked a touch-enabled display on this, I’ve found the ADR810 dash cam easy to use and navigate. As soon as you start your car the dash cam starts working on its own, so it’s a case of plug-and-forget about it. 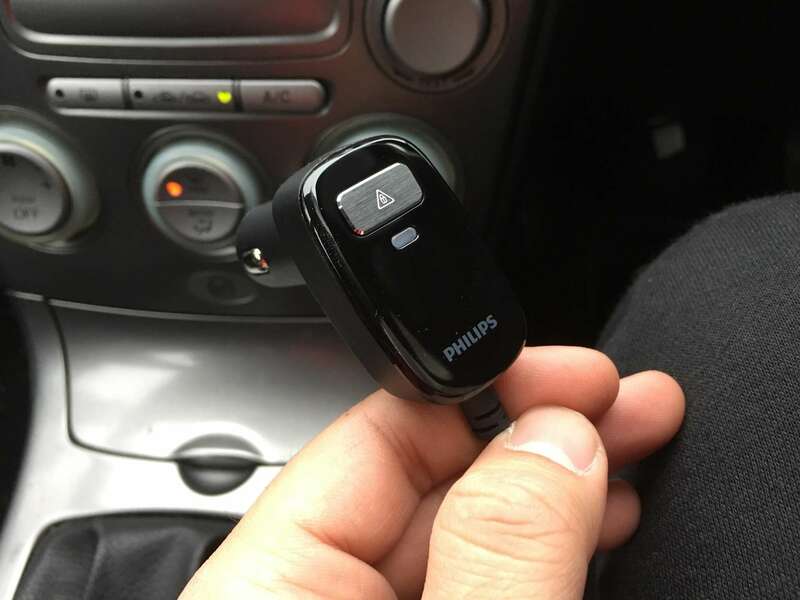 Philips gave the ADR810 a grid-based menu so that you can only see 6 options at a time, and you navigate using the up/down buttons on the dash cam itself to set things like the recording resolution, language and even the sensitivity of the camera’s collision detection feature. I’ll need to use it for a longer period of time to really get a feel for it, but on my first day I’ve found it quite simple and easy. If you’d like to see some sample clips of the Philips ADR810, leave me a comment below and I’ll make it happen!